We’ve been around for a while – since 2003 in fact. During that time we’ve had the pleasure of serving over 20,000 businesses all over the world. Tell us what you need and we’ll do the rest to make sure you’re our next satisfied customer. We were very impressed with our London Translations translator. On all occasions their translators have been very professional, astute and worked so well with our team. I would have absolutely no hesitation in recommending these guys to anyone looking for an excellent translation service. 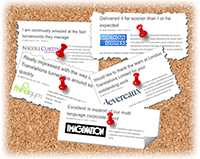 We are very happy with your services and can only recommend you highly enough. You did absolutely wonderful translation. We will not hesitate to use your service again in the future. 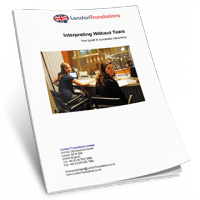 This handy independent guide tells you all you need to know for a successful interpreting event, no matter which language company you choose.